The season is largely over. The Orioles are miserable. They are not the worst team in baseball, but they are the second worst, by one game. Amazingly, three have been no major changes to the coaching staff. Given the line-up of hitters the team possesses, one would expect the hitting coach to be out the door soon. The Orioles are 17-39 .304 and have no where to go but up. They are potentially on track to set a franchise record for losses at and might finish as bad as 51-111. The team has the third worst batting average in the American League at .233, which is 15 points lower than the league average. But what really hurts is they'll have the worst on base percentage at .295 which is 23 points below the league average. One of the few brighter spots is that the team sits at the league average for home runs at 64. Base running situation awareness is also a problem. For instance, last evening, with the team losing 2-0 in the bottom of the ninth, the Orioles got two men on with no outs and Manny Machado coming to the plate. During Machado's at bat, one of the base runners decided, for some obtuse reason, to attempt to steal third and was caught stealing in a run down. Suddenly, the opportunity to win the game with one swing of the bat was gone. After the base running mistake, both Machado and Scoop, the next batter, failed to get a hit and the O's lost 2-0. The fan base is unhappy and eroding and we hear nothing but crickets from the Orioles front office. I have tickets for tonight's game against the Yankees and I will likely not bother to go. Who wants to see a complete baseball team deliver another crushing blow to my favorite team in our home park. I do expect lots of homers tonight. 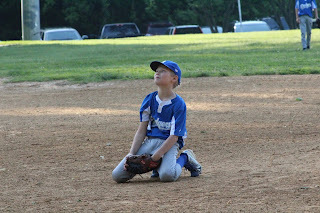 The GORC Dodgers have once again lost two in a row. Last evening, they lost a close contest 9-8. The team had the lead twice during the game but could not hold it. 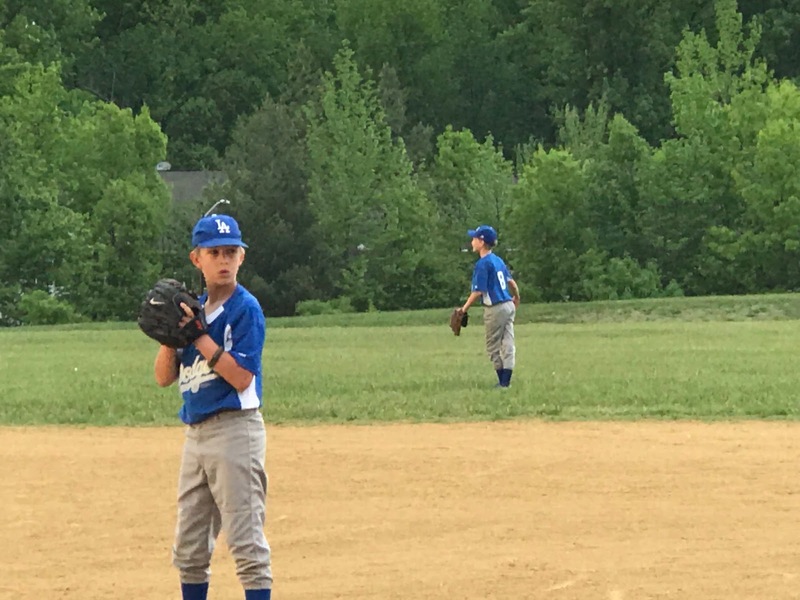 They had the opportunity to force the opposition into the bottom of the sixth, however, the bats were not as crisp as they had been recently and the team just could not get the needed runs across the plate despite having the bases loaded. The season is coming to a rapid close. The team has one more practice and one more regular season game before the playoffs. At least the weather has moderated and we are actually playing some of the games. Despite the loss, the boys played hard and made some good plays in the field. It was fun to coach a close game and we knew that every run would count. Sadly, they wound up with one more than our guys. But, it was a learning experience. Memorial Day is the unofficial beginning of summer. To celebrate the beginning of the best season, yesterday was an especially cool day, following days in the high 80's and low 90's. But, we are poised for the run at summer with the fireflies cued and the smells and sounds of the season ramping up to make an imminent appearance. The pool is open and I've been in it a couple of times. 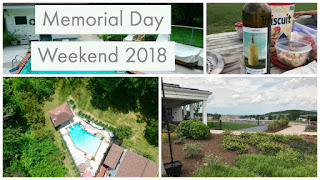 It was too cold yesterday, but Saturday and Sunday were definitely pool days. The days of summer are upon us. 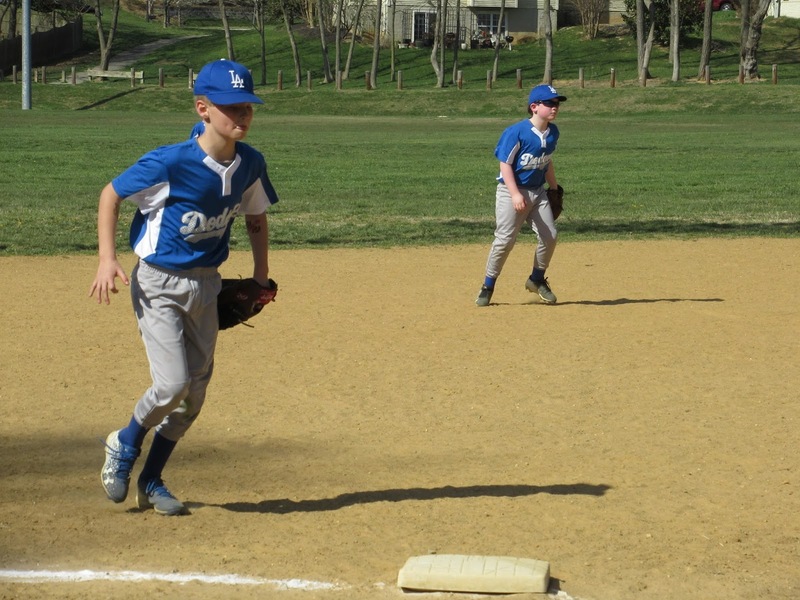 Baseball is getting deeper into the season and tonight the GORC Dodgers take the field again and hope to reverse the poor play they displayed during their last game. Summer sports and vacations. The time has finally arrived. School is ending soon and the vacation season will be in full swing. Bring on the sun and season! 1. Happy Memorial Day 2018. 2. We survived the deluge which by some accounts saw 8.5 inches of rain fall in two hours yesterday. Officially we only received just over an inch of rain although it certainly seemed like a lot more. We will begin the clean-up process today. Thanks to all who wrote/called with concerns. 3. Chris and I accompanied by two friends spent a wonderful afternoon at Big Cork Vineyards in Rohrersville, MD. We enjoyed music and some nice wines in a beautiful setting. 4. 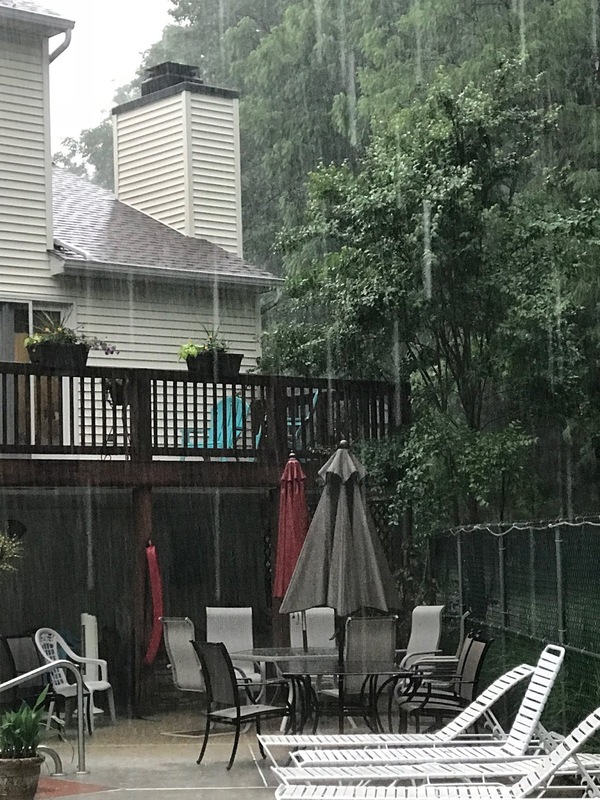 Our prayers and support go out for the people of Ellicott City who yesterday experienced a second devastating flood in less than two years as as a result of the torrential rains. 6. It is tough to play baseball after being off for two weeks. The GORC Dodgers lost in a blow-out on Friday night. There are two games remaining in the regular season and then the playoffs begin next week. 7. I am glad that I mowed the lawn yesterday before the rains turned the yard into a soggy mess. "The character of the American people is our country's most precious asset, and, like any asset, it should never be taken for granted." The family gathered yesterday to celebrate Memorial Day. We gathered early because we found a break in the weather that would support a picnic. The day was pleasantly hot, with the temperature hitting 91 degrees. It was a perfect unofficial beginning to the summer season. The day was hot, the water in the pool was warm, and the family was mostly gathered for some fun and interaction. Radio Flyer got to fly and observe the scene. It had been a week since my drone had flown. Last week it was in Ithaca and I did not take it with me on my trip this past week, although it will likely accompany me in the future. Enjoy your Memorial Weekend. Remember the sacrifice of our military members of the past and present how have helped to secure our freedom. Airports can be interesting places to explore while waiting for flights. 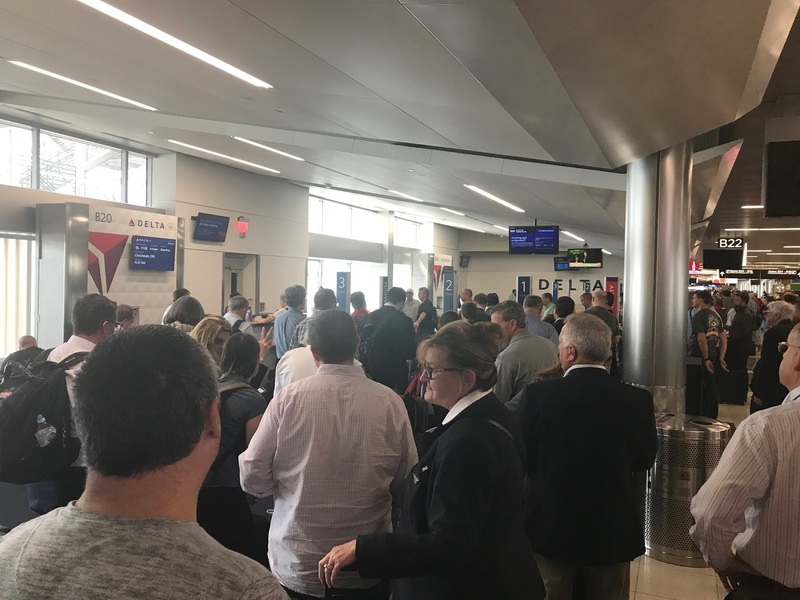 I have found that some airports are committed to improving our sense of history and not always about air travel and the development of the aircraft. The Cincinnati airport advertises the local museum. 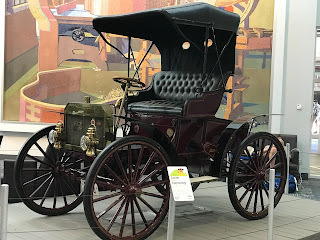 One exhibit that displayed as I passed through yesterday contained older automobiles spanning a few decades made by companies in the Cincinnati area. 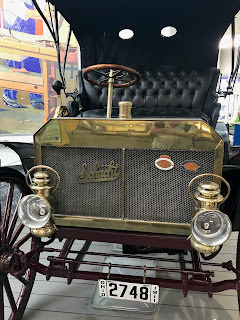 It was very interesting to observe the development of the car. The Model K Runabout has the driver sitting right behind the radiator. While the license plate suggests it is a 1911 auto, the model dates from at least 1910. A later example of the auto development was in the wooden vehicle, which was dated 1925. I have to admit, I didn't get as much information on this vehicle. 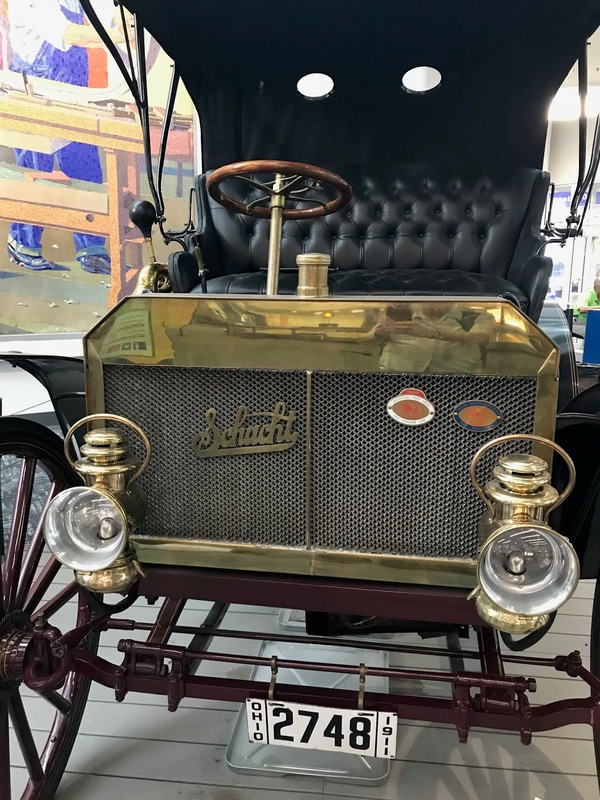 I tried the museum website but could not positively identify the car. 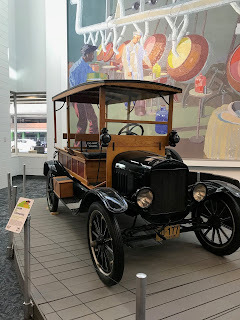 There were many other exhibits from the museum in the airport and I actually look forward to heading back through the airport sometime to view other displays. 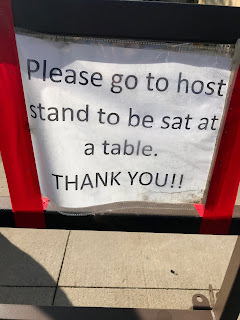 I went to dinner last evening. It was a nice beer garden type restaurant and I enjoyed a couple of nice beers while I was there. It was the sign I passed on my way inside that caught my eye, however. I guess someone should have thought about what to write to get the message out in a more grammatically correct fashion. I know that all too often in this blog that I forget to proof what I am writing and I write some really interesting sentences. I also fight the autocorrect feature that all-to-often picks the wrong word for what I am writing. But, that written, if I was posting an important sign in my establishment I hope I would ensure the message was clearly and correctly written. 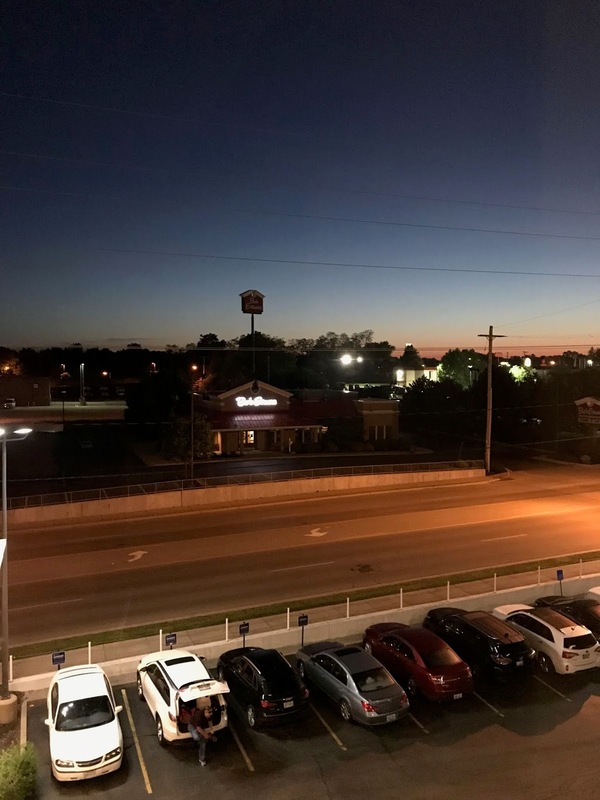 In addition ot the fun dinner, I was treated to a beautiful sunset out my hotel window which provided an exclamation point to a full and busy day. 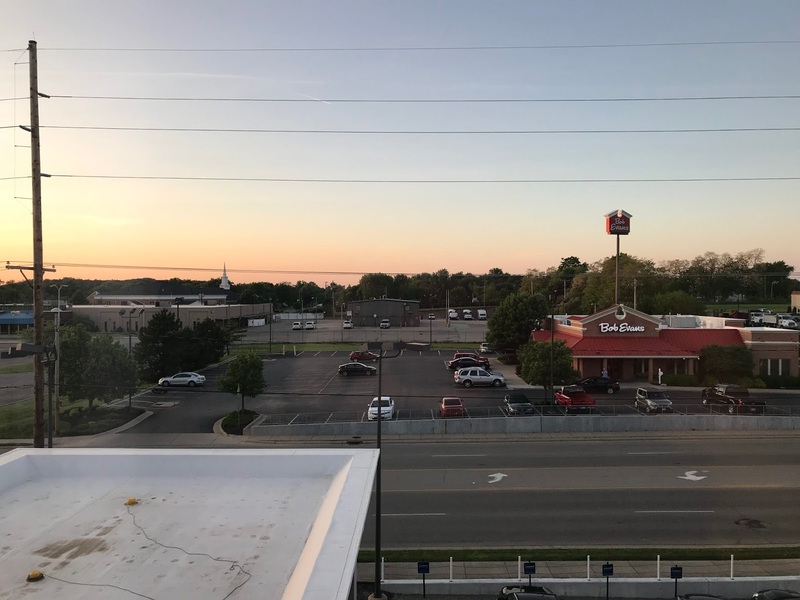 The clear sky was beautiful and the sinking sun, even behind the Bob Evans from my hotel room, was an enjoyable sight. I went for a walk last evening. The idea was to walk to dinner and then back, but due to the drenching rains that started during the walk to dinner, I only walked to and not from the eating establishment. I walked along a canal/creek for most of the way. At the end of the park was a climb up some stairs to get to the city level. I had intended to take a picture of the canal and part from the higher street level, however, the trees were full with leaves and blocked the good vantage points. Since it was raining, I was not too motivated to find a clear shot of the park below, hoping that I would find one during the return trip. 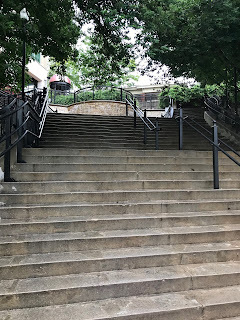 Since there was no return trip through the park I lost my opportunity and am left with only a memory and this image of the stairs at the end of the park. I need to remember to be more aggressive in taking the images that I see in my mind when they are happening on the first occasion. It is good to be back in Huntsville to celebrate the Springtime and graduation season. Yesterday as I was arriving, there was a major graduation event occurring at the Convention Center. 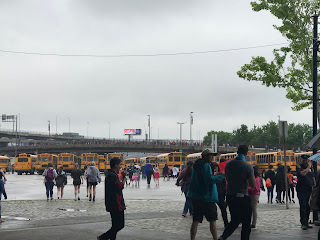 There were students and adoring families everywhere and it was an exciting sight to see. The view out my window is very exciting. There is a lot happening. I enjoyed watching the parking garage in the distance fill and then empty yesterday during and after the commencement. It was good to get to blue skies with white puffy clouds! The trip was uneventful and I look forward it a good week of work away from home-base. As an important note, since this is a work trip, I did NOT bring Radio Flyer with me, so there will be no drone images to share. 1. Hopefully, the rains of the past week are giving way to some nicer weather. It has been a bit oppressive. 2. Driving back form Upstate NY yesterday I was amazed at the speeds some of the drivers were reaching. I am sure a couple of people passed me doing sat least 90-100 mph. 3. 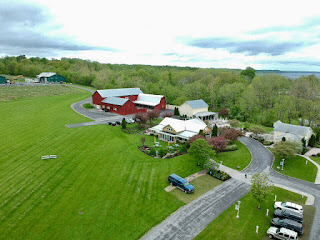 Chris and I did stop in Pennsylvania to visit Fero Vineyards and Winery in Lewisburg yesterday during out drive back. It was a much needed respite during the trip. 4. It was amazing how the weather got better the further south we drove yesterday. Maybe nicer times are really ahead and the rains have subsided for a while. 5. Isn't it amazing how sometimes victims are victimized twice, the second time by the very people or businesses that are "trying" to help them? 6. 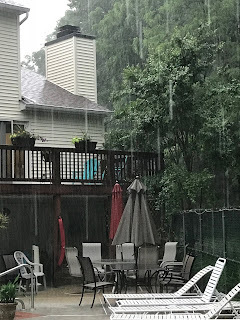 I had this phrase pop into my head yesterday as I was looking at the rain clouds: the pregnant clouds were ripe with rain destined for the earth. 7. 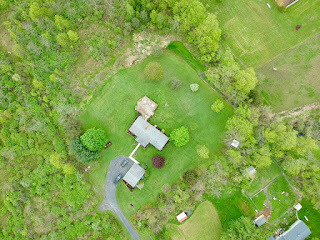 I enjoy looking at the earth from above while I am flying Radio Flyer, my drone. I guess I am just a frustrated pilot and the ability to look down on the scene below is exhilarating. 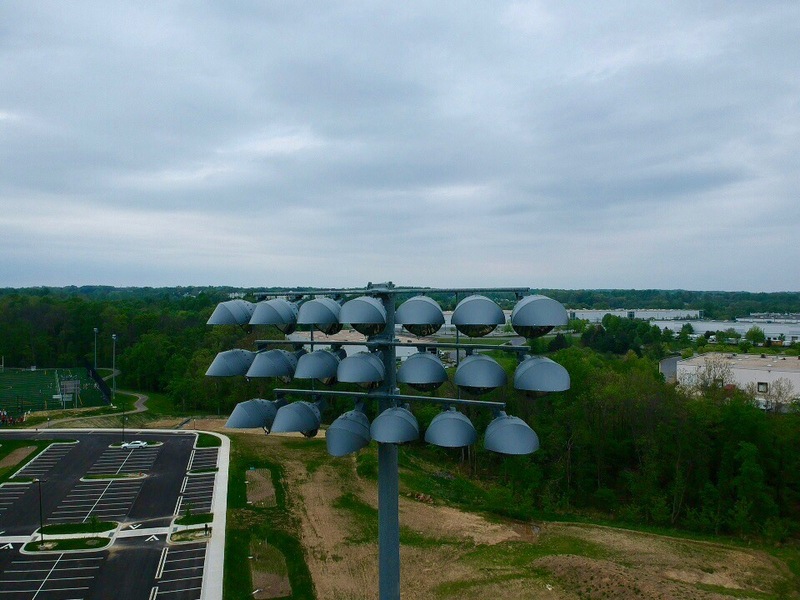 I am becoming especially excited about imaging the "Bird's Eye" view. 8. Chris and I stopped at a flea market on our way out of Ithaca yesterday. It had been quite a while since we had been to one. I believe we will be going to more. "Today millions of Americans are asking themselves that same question about the dedicated men and women who serve in our Armed Forces. Like me, they're asking that question with gratitude, with respect and affection in their hearts. Today, I want all those wearing American uniforms around the globe to know: America is grateful to you -- and proud of you, too." 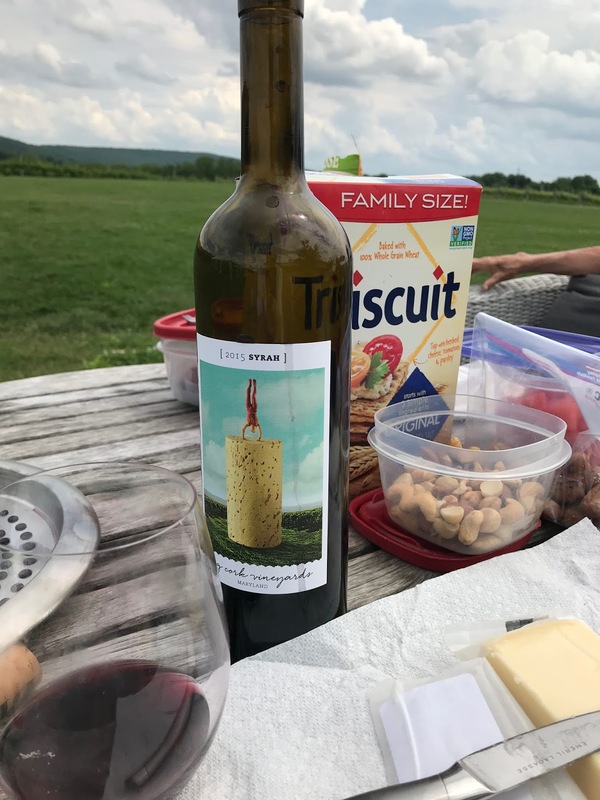 During our short weekend visit to upstate New York, I of course had to visit a couple of my favorite wineries. 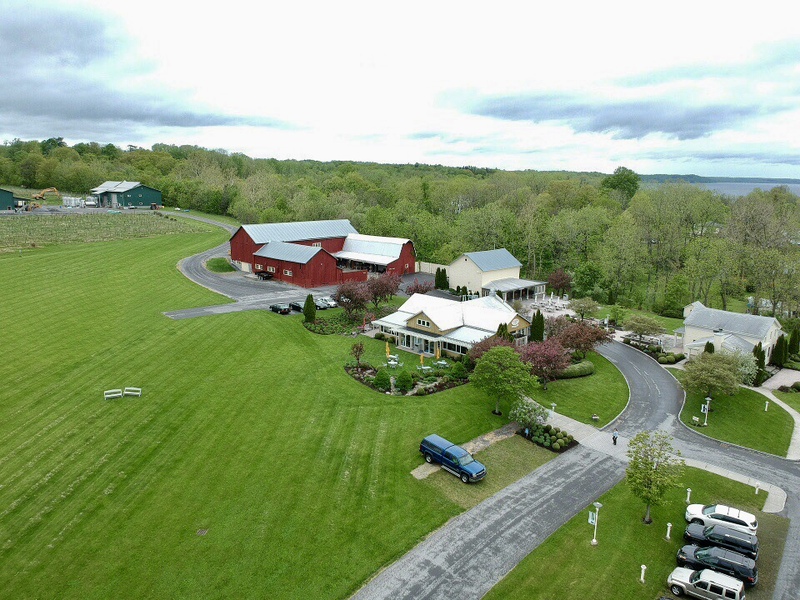 Our house white wines are from Americana Winery and Sheldrake Point Winery. So I visited both yesterday in the rainy weather that followed me from Maryland. Chris and I of course have our favorite wines from both, however I was disappointed to find that both were out of the wines that I was seeking. At Americana our favorite table white is Apparition. It has been immensely popular and I was able to purchase the last four bottles. They are bottling more next week I was told. Yay. I added eight bottles of Riesling to round out the case. The news was not so good at Sheldrake Point. Our favorite white table wine from there has been Luckystone White. I was informed that this wine is no longer produced and there were no more bottles to purchase. I tasted the Pinot Gris and decided that it was a very nice substitute. And so, I was able to obtain a case to refill the wine cellar. The image is of Sheldrake Point. I was able to fly Radio Flyer during a break in the oppressive weather. I obtained some nice shots of the lake and the vineyards as well. 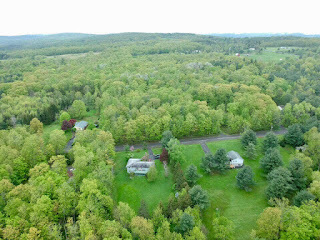 Chris and I drove to upstate New York yesterday to spend the weekend with family. After breaking free of the gloom that has descended upon Baltimore we found sunny skies. It was awesome. 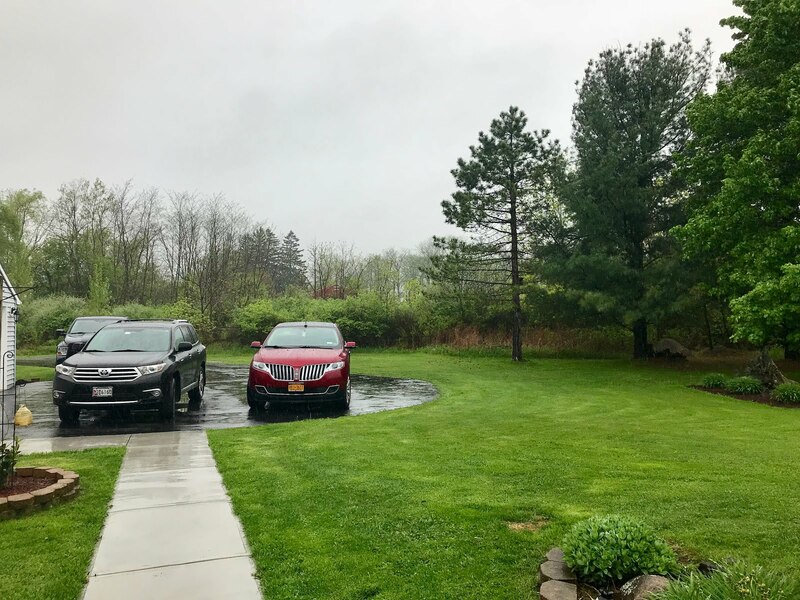 Overnight, however, the rain followed and the gloom and rain of the past week has now enveloped central New York. Ugh. I had wanted to fly Radio Flyer, but it is raining. The springtime is in full bloom here. It is like backing up three weeks in time. The trees are green, but the leaves are definitely new. I need more sunshine and less precipitation. The rains of the past few days has been pervasive. The gray skies with their constant rain are sucking the energy out of the area and turning traffic into a nightmare. 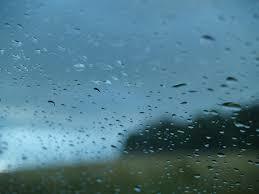 I feel as if I have moved to Seattle, where rain is expected daily. Traffic gets completely slowed with multiple jams during rainy times. It really causes a mess on already too full highways. Too many cars traveling too slowly. It increases a usually 20 minutes trip home from work to 40 or 45 minutes of frustrating driving. Aside from the nightmare on the highway, there are the canceled activities. 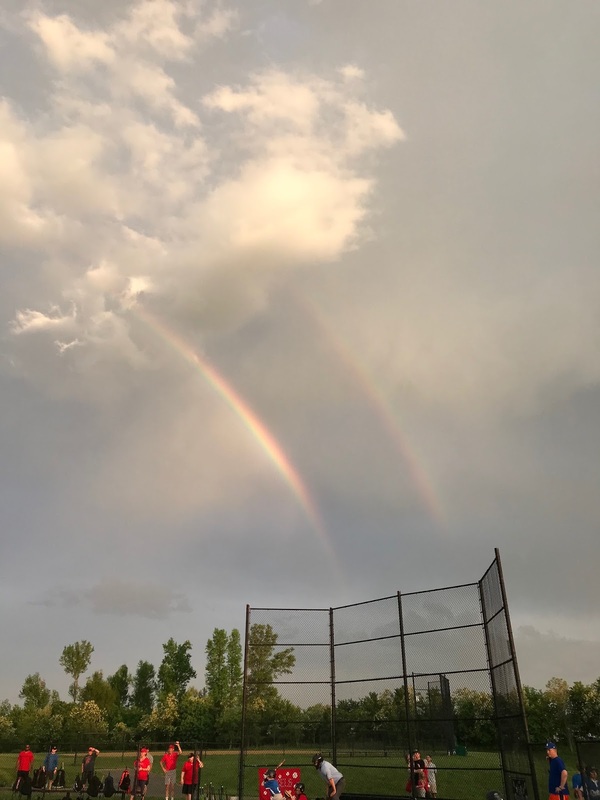 This week the GORC Dodgers have seen both of their games canceled and it is likely that tomorrow's game will similarly be canceled due to poor field conditions, continuing precipitation, and thunderstorms. In good news, the pool is clearing nicely and is ready to accept activity. 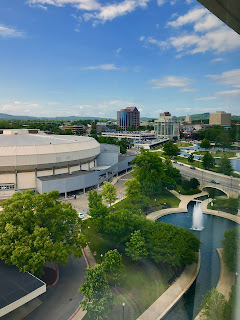 All we need now are sun and warmer temperatures to arrive and let the good times begin to roll! I attended the afternoon Orioles game yesterday. In the rain with a group from work. It was a fun afternoon, except for the fact that the Orioles managed only four hits all day. The rain was almost constant, but did not dampen our spirits too much. The Orioles held a 1-0 lead until the 6th inning. After giving up 3 runs to the Phillies during that inning, the game was pretty much over since the bats were mostly silent all day. The final score was 4-1 Phillies. There were too many strikeouts. The Orioles struck out 13 times. That means they failed to put the ball in play on 48 percent of their 27 outs. During one exciting stretch the Orioles managed to load the bases with one out. They scored zero runs for that effort! Watching such a game during rainy conditions definitely was a spirit buster. But it was an afternoon out of the office at the ballpark. I was amazed how many people showed up to the afternoon game. The official attendance was 29,706. I was amazed how many school groups attended the game. 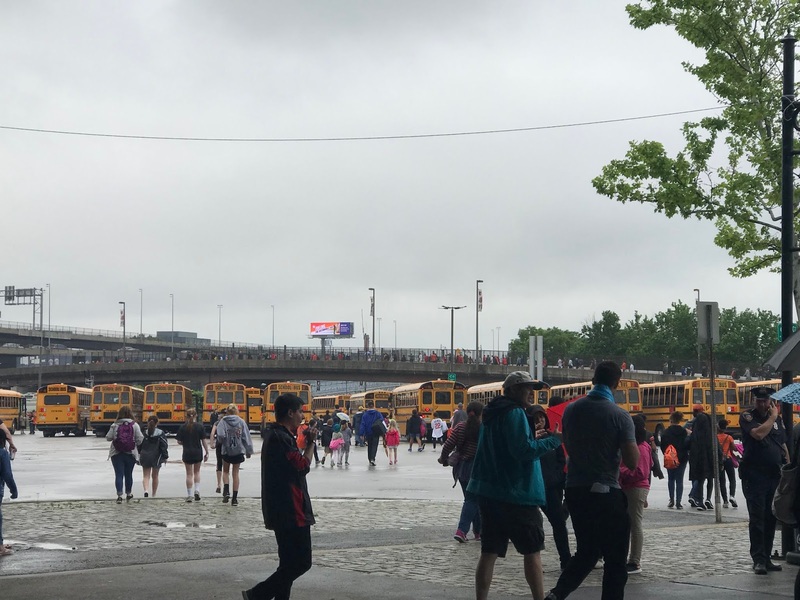 The number of busses in the parking lot was amazing. I guess the Orioles need to schedule more afternoon games to bolster attendance. Of course, winning would help with that as well. The thunderstorms from Monday evening were strong enough to cause the GORC Dodgers game to be canceled last evening due to field condition. 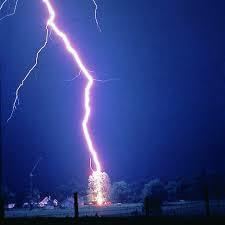 And it is likely to be a repeat tonight as the storms last evening were every bit as fierce as the ones Monday. While the rain is causing the plants to grow, it is playing havoc with sports schedules. I am seeing the afternoon game today, however. It is a 12:05 start! Something very different for the Orioles. It is one of their very few day games during the season, other than Sunday games. The Orioles are doing much better of late. They are 5-2 on their current, now eight game, home-stand due to last evening's rainout. That brings them to 5-8 for the month. I hope the turn around continues. I hope the weather is nice this afternoon. 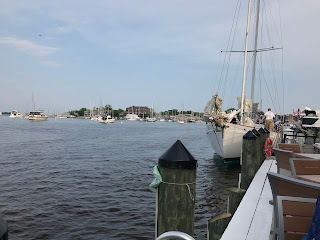 Last evening, our friends who live on a sailboat came ashore in Annapolis and Chris and I met them for dinner and conversation. It was a beautiful evening before the thunderstorms rolled in and covered the land with rain. We sat and enjoyed some wine and appetizers followed by dinner at a restaurant right on the water where we could enjoy the sights and sounds of Annapolis Harbor. We had a good view of their boat moored not so far away. We talked about the places our lives had taken them in the months since they last sailed through. It is always fun to chat with them and vicariously enjoy their lives. I don't think I could survive on a sailboat. They indicated that it had been four days since they had gotten off the boat. Ugh/ That is a long time. 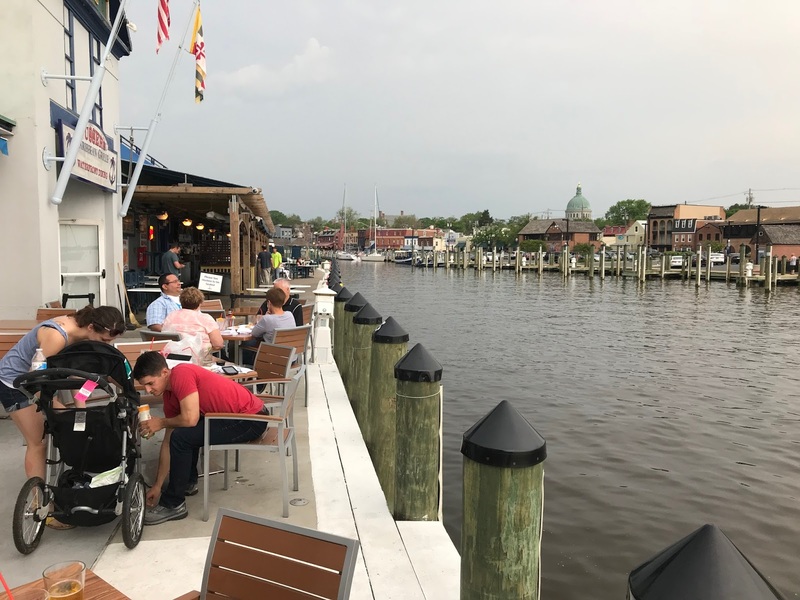 Yet, sitting on the dock beside the water having dinner did not seem to be boring to them. Although they see the water every day, they do not tire of it. 1. May is cruising along and the wild weather ride continues. 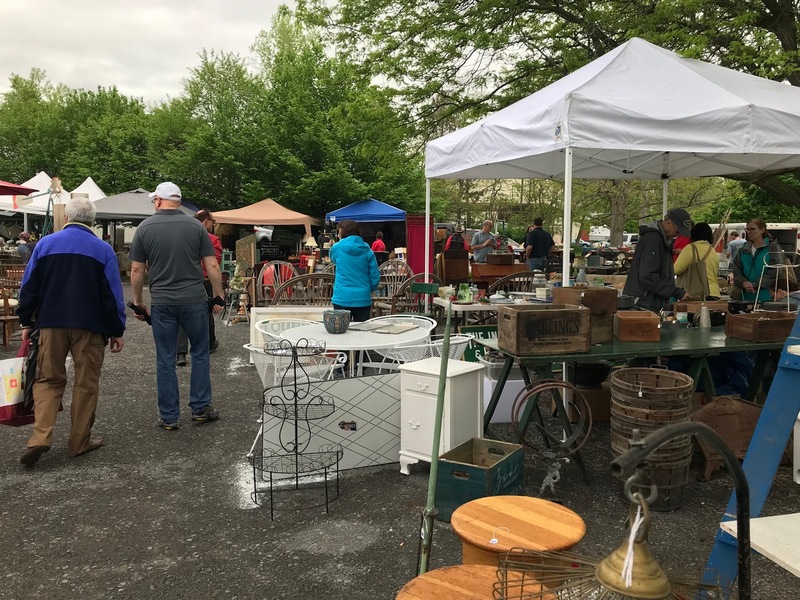 While it was 87 degrees and sunny on Saturday, yesterdays;' high was 62 degrees under cloudy and generally rainy skies. Today is expected to see the high reach 80 degrees. 2. Action shots say it all. Jackson is about to tag the base stealer attempting to take second out. He has the ball and the bead on the runner. The umpire, however, called the runner safe. Wow. It would have been the second caught stealing runner on the game for the Dodgers on Saturday. 3. The Orioles have won two series in a row for the first time this season. They are 5-2 in their last 7 games and had a 4-game winning streak at one point. Yesterday was a 17-1 victory. 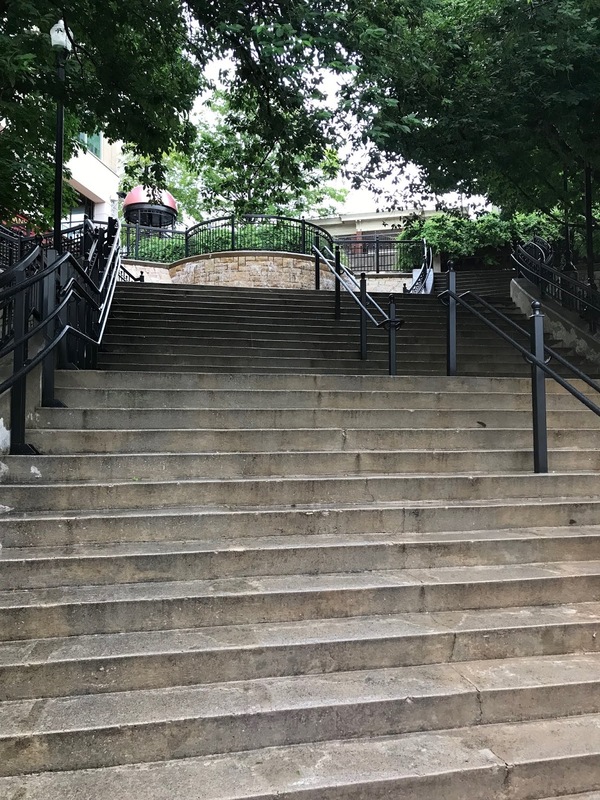 I hope they have finally turned the corner. 4. What to do on a rainy afternoon and evening? Watch movies and series on Netflix. Chris and I finished watching the Netflix series Lost in Space yesterday. 5. The pool is looking swimmable and except for the cold temperature, it is ready to host fun! 6. 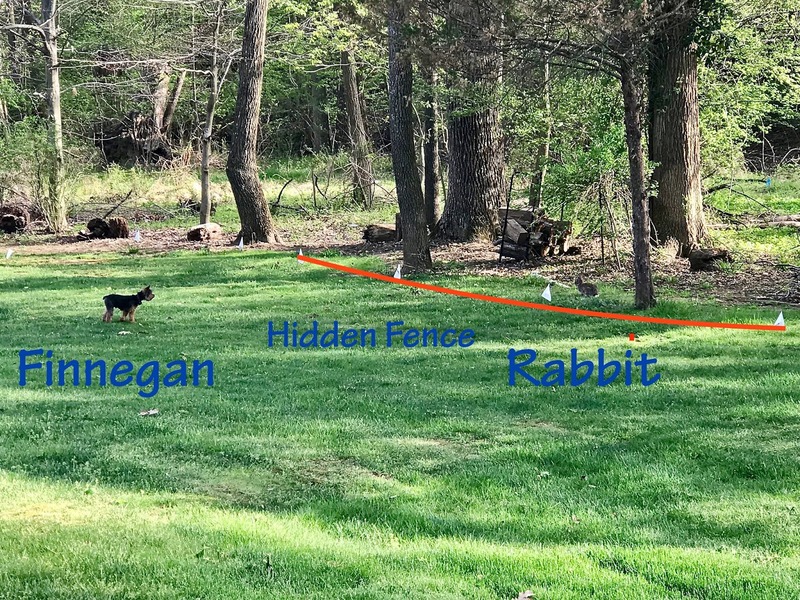 What does a dog do when separated from a rabbit by a hidden fence? Answer? Look and wait. 7. Enjoy Monday. Just remember that Tuesday is not far behind. "For all Americans, we want to open more and more paths of opportunity in education and expanding scientific literacy and fostering new technologies and, through new technology, new jobs for the future; and building a fair, free, and growing world economy that gives hope and opportunity to all Americans, all mankind." 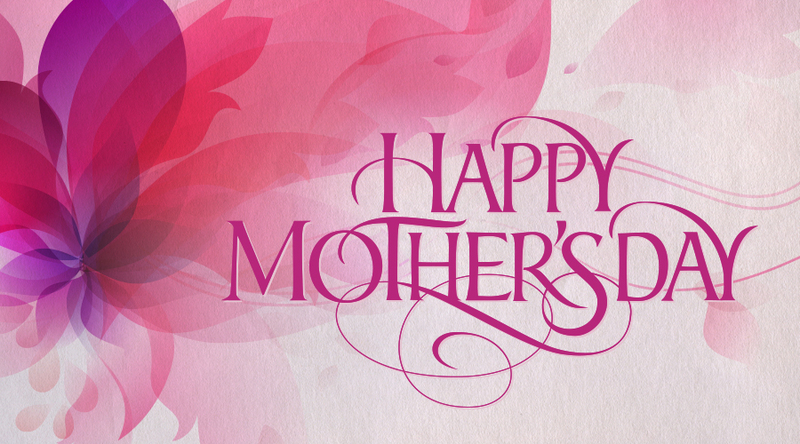 First off, let me say Happy Mother's Day to all of the mothers. Yesterday was a hot Saturday. Although the temperature only made it to 87 degrees, it felt much hotter. Despite the heat, which was very nice, a lot of activity was accomplished around the house. 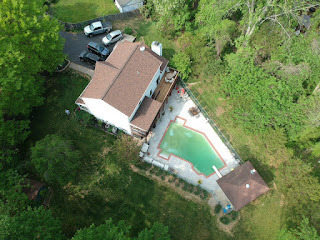 The pool continues to clear and is almost ready for the first splashes of the season. The lawn was mowed again and looks good. I actually enjoy mowing the lawn because it means that Springtime is in full swing. But, in the real highlight of the day was that the deck was restrained. 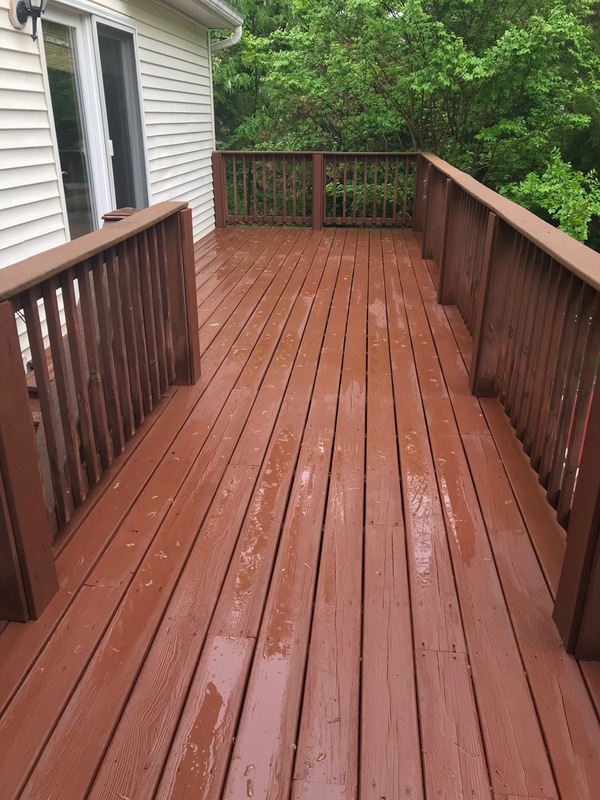 Fran and Chris got two coats of stain down on the deck with enough time to cure before the evening thunderstorms arrived. It looks very good and is a major springtime project completed. 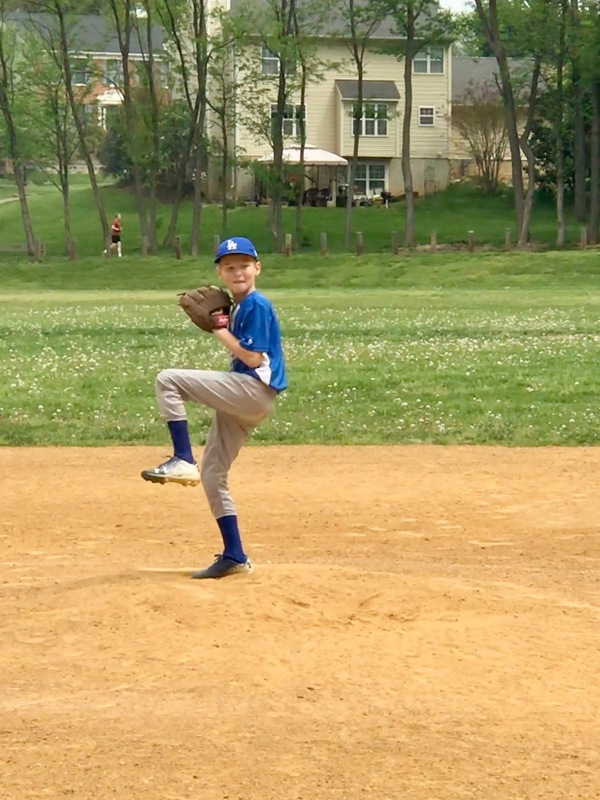 And in the sports report for the day, the GORC Dodgers played a tough game against one of the two teams that defeated them last week and pulled out a hard fought 14-12, 4 inning victory. It was exciting especially since the Dodgers were the away team and they had to hold the opposition to less than 4 runs during the last half inning--which they did! The Dodgers now have a three-game winning streak. The heat was definitely a factor during the entire day. But it was a great day. It arrived yesterday. 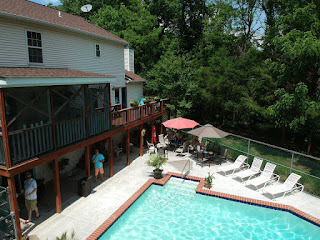 The annual pool opening day event. I had help this year and the whole process went fairly well. 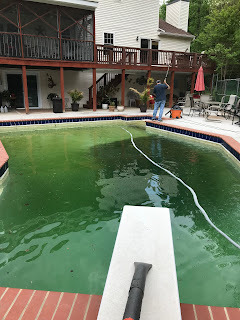 The pool had not fared well during the off season and there was a lot of muck at the bottom from the winter. 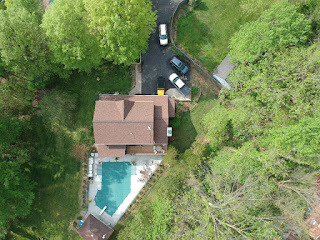 The pool is clearing up nicely and the back of the house looks much nicer from the same with the pool cover gone. I can almost believe that the summer is coming. The days have been fantastic and truly summer is getting very close. 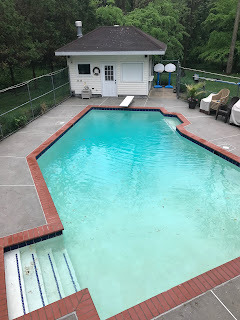 There is still a lot of work to do on the pool to get it into swimming shape, but it should be ready in a few all too short days. I have discovered that my drone is the ultimate selfie machine. I God an image of me with Makayla yesterday as I was landing Radio Flyer after cruising the neighborhood and taking images of the pool after the opening event. Makayla did not mind the buzzing of Radio Flyer until it got wishing a few feet of us. She accepted it, but was very wary. I am just impressed with the amount of green in the image. I love the green and I firmly believe that the reason that I despise winter is because the green goes away. But, the pool is now open and almost swimmable. The trees are in full leaf. The grass in growing, probably because I put fertilizer on it so that I could cut it more. 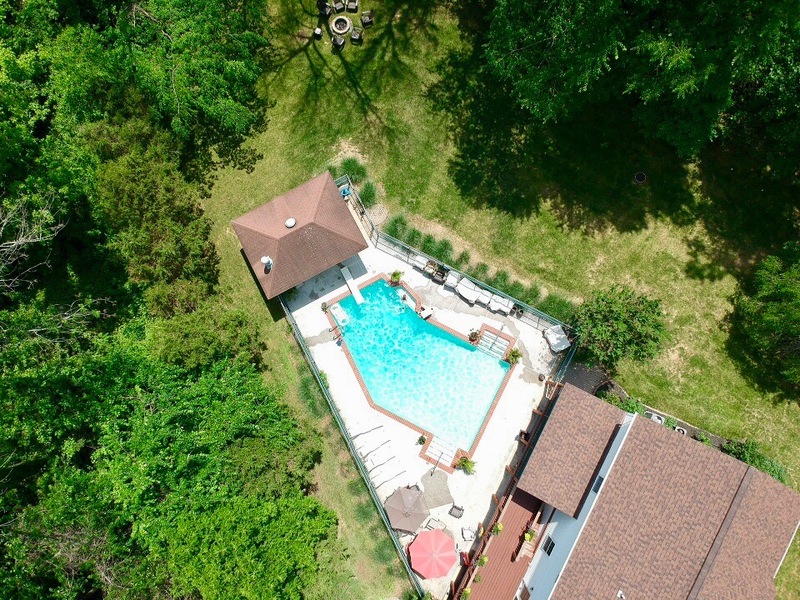 The pool, the grass, the trees. Cue summer! 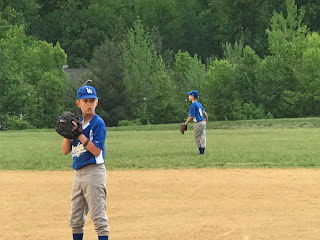 Despite the weather forecast which made it seem as if torrential rains and thunderstorms were imminent, the GORC Dodgers met the GORC Angels for their rescheduled game last evening. There were some sprinkles off and on at times during the game, but the weather held and we were treated to a an infrequently seen double rainbow towards the end of the game. The boys played a complete game with solid pitching, hitting, and fielding to defeat the Angels 12-6. The game started off fairly evenly with the score after one being 2-1 Dodgers. Then the scoring began in earnest. The game only went four innings due to time limitations and darkness. The innings were often long and laborious, but the boys played hard and made some good outs in the field. Once the bats got going everyone up and down the lineup contributed. It was great to have the guys get back into their winning ways and play hard-nosed baseball. Saturday presents the opportunity to get even with one of the teams that beat us last week. 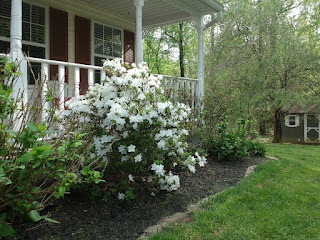 It is Springtime and the Azaleas are in bloom. 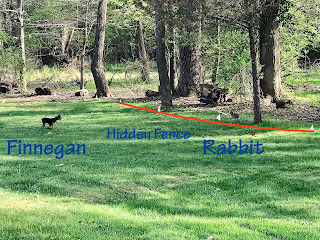 The white one in my yard is magnificent. The blooms are fully opened now and the splash of white against the backdrop of green is stunning. Although not easy to discern, this image was obtained using Radio Flyer, my drone. 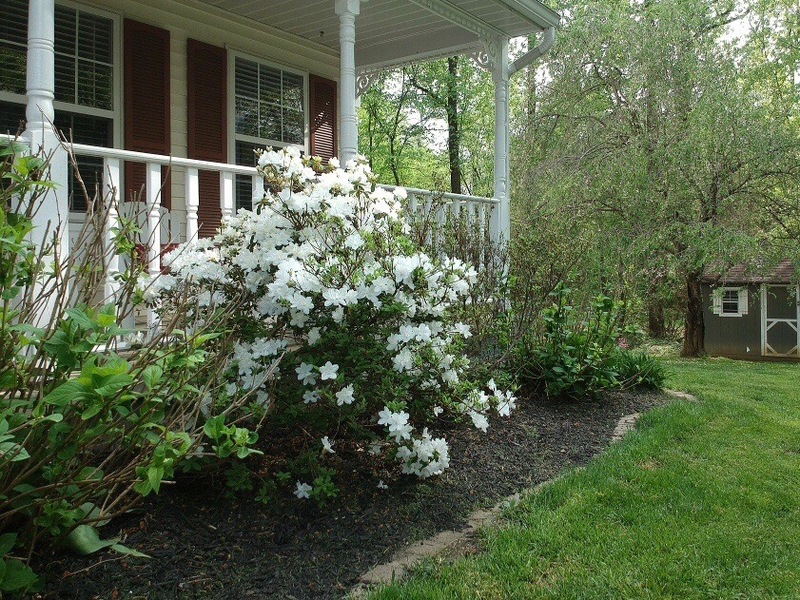 The Springtime flowers are all in full bloom around the house and the neighborhood. It is a great time of the year. I have determined, from weather forecast that the pool will be opened on Friday. 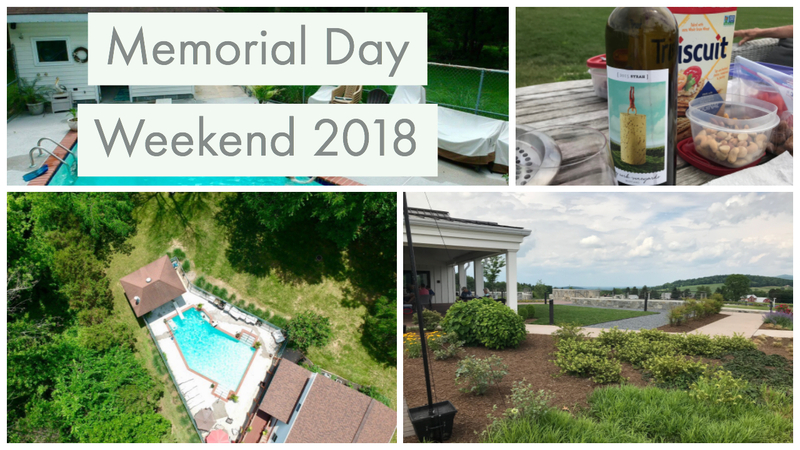 Once opened, then the preparations for the impending Memorial Day Holiday will be complete. Some nights the baseball just does not seem to bounce in the right direction and the umpire's calls seem to go the other way. The GORC Dodgers ran into a buzz saw and lost to the Diamondbacks in a game the was tied 0-0 at the end of the first, but ended, because of time expiring, after four hard played innings at 15-5. I really though we were going to end in a 10-10 tie, but that is where the Umpire ripped the boys hearts out with some incredibly close calls at the plate. To say that it was not our finest hour is an understatement. The hard part was that it wasn't hit balls that were the problem, it was the walks; hence, the game dragged on forever. To say it was another hard learning experience is an understatement. We really need another practice, but there are none on the schedule. Oh well, there is another game on Thursday! For the first time in three years, the Penguins will not be playing hockey while other teams continue their playoff runs. The Washington Capitals made a bit of history last evening by overcoming the curse of the Penguin and winning their first playoff series against the defending Stanley Cup champions since 1994. I have to say congratulations to the Capitals and I actually hope they can bring to Washington their first ever Stanley Cup. The city deserves it after decades of dashed hopes. 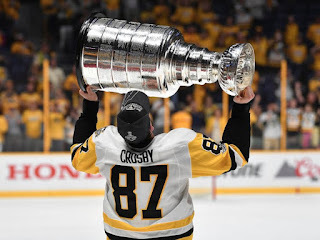 With the dreams of winning three consecutive Stanley Cups dashed, the Penguins get a well deserved off season to lick their wounds and prepare for the next campaign which starts in five short months. I guess it is time to move onto the next sport--baseball. 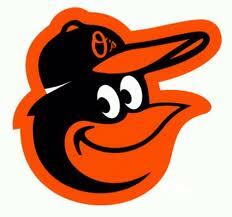 I hear the Orioles are trying to lose over 100 games this year. 1. 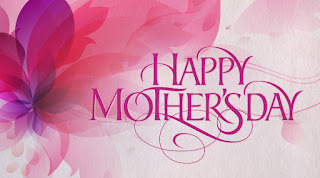 It is the first Monday of May. We have already enjoyed three celebrations: May Day, May the 4th Be With You, and Cinco de Mayo! What a great month. 2. 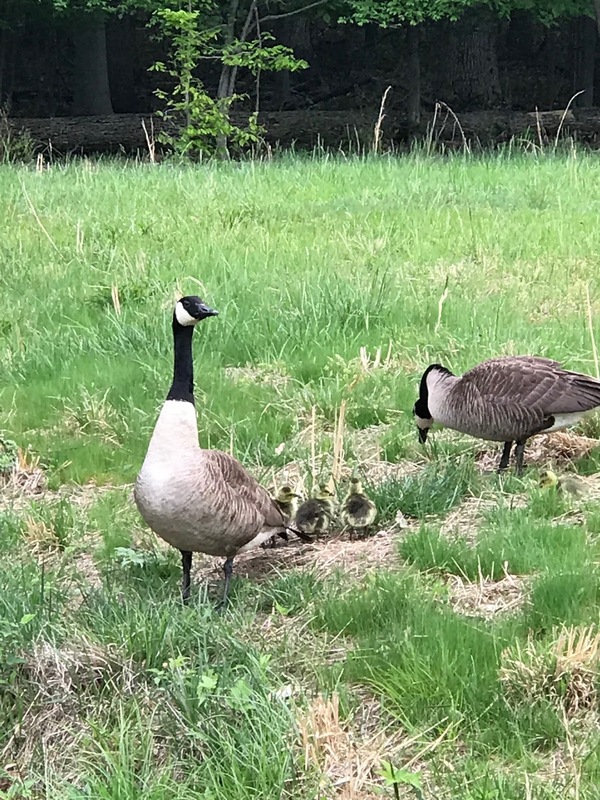 I played golf yesterday and came across this goose family. 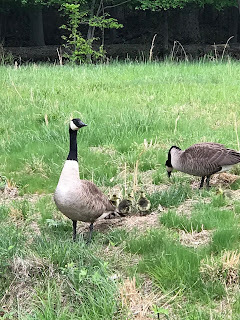 The adults were very protective of the goslings. I was being watched very carefully as I searched for an errant shot. 3. The trees are really rocking the green. My house is not completely surrounded and the solitude of my back yard has returned. My drone was able to document it yesterday. 4. I took Radio Flyer to a new place yesterday. Troy Park, year my house. 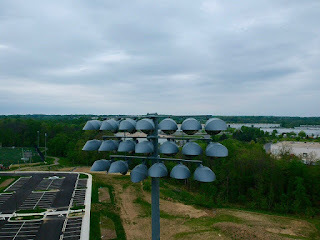 I decided to fly up a light pole and examine the lights. They are very interesting as you get to the top. It seemed like a long way up! 5. There is almost nothing better in the world than sitting outside on a beautiful evening and enjoying a glass of wine, or two, with friends. 6. 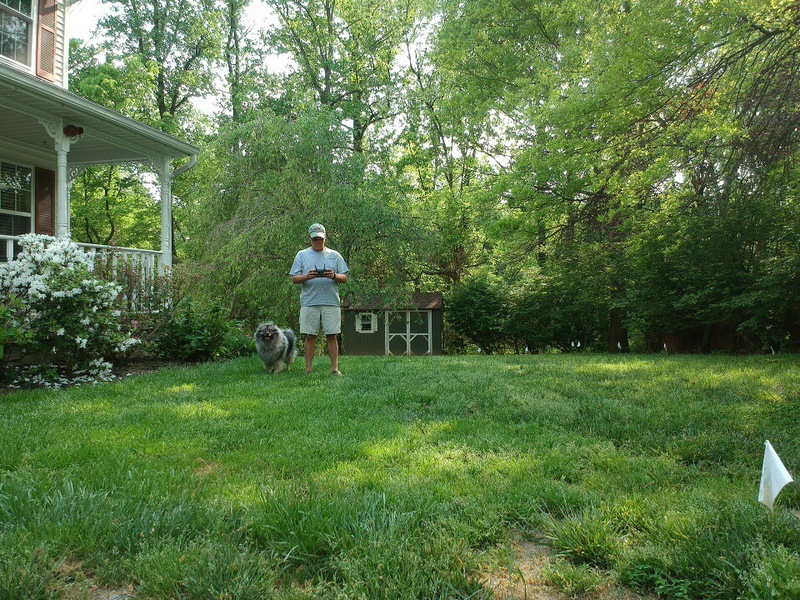 I have mowed the grass now three weeks in a row! Yes, the Springtime is in full force. 7. The Orioles remain winless for the month of May. The hoped for turn around still has not occurred. "Once you begin a great movement, there's no telling where it will end. We meant to change a nation, and instead, we changed a world." 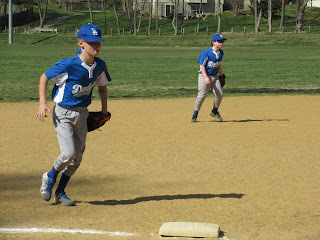 Entering the day as the only GORC Intramural Team with an unblemished record, the Dodgers faced a determined Orioles team. 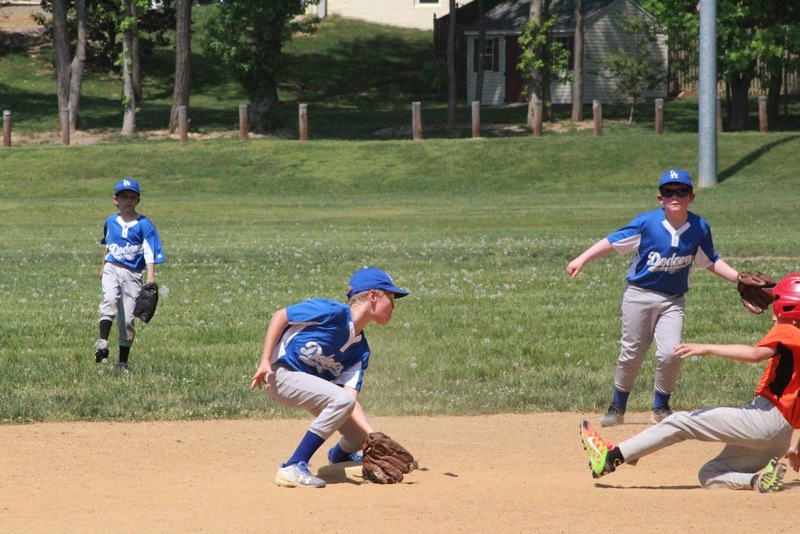 The game started evenly, with both teams scoring single runs in the second inning. Then the Orioles scored two runs in the third. Things got away from the Dodgers sat that point. 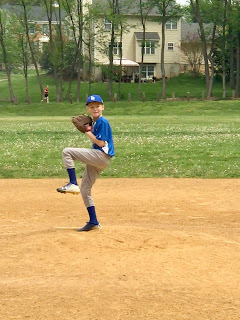 Jackson pitched the first three innings. His longest outing of the season. He was tough and had good control. The bats were mostly silent during the day. The boys could not seem to string hits together. There were some fantastic moments, to be sure. A bases loaded double in the bottom of the 5th scored two runs, but that was all the Dodgers would manage for the day in a disappointing 11-3 loss. The great thing about baseball is that there is another game coming where the team can get back onto its winning ways.